The Clipsal Wiser Link product is a recommended alternate product to the Clipsal EcoMind . Energy monitoring makes successful energy management simple. 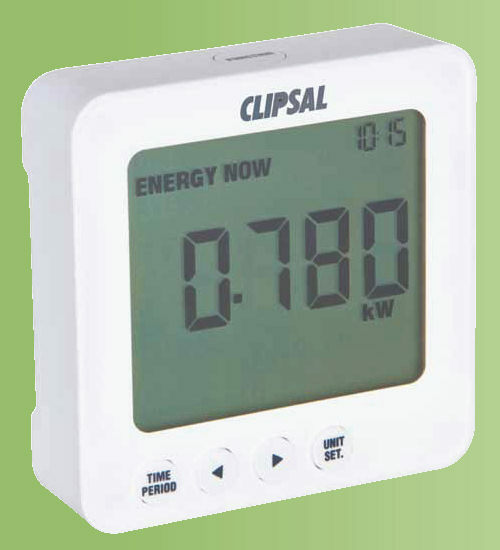 The Clipsal Ecomind Electricity Monitor is a wireless electricity monitors that allows you to monitor and analyse your electricity consumption and through that previously hard to obtain information, learn how to save energy and help the environment too. With the Ecomind Electricity Monitor you can identify how much electricity is being used at any time, enabling you to make instant changes that will help you reduce your energy consumption. The Ecomind Electricity Monitor will help you take control of your electricity consumption allowing you to save money on your electricity bills. It displays your usage in dollars ($), kilowatts (kWh) and carbon dioxide generated producing that power (KgCO2). You can also track your highs, lows and changes by the hour, day, week or month. For more advanced monitoring, you can download the Ecomind Electricity Monitoring Software from clipsal.com/ecomind to track your electricity usage from your computer or digital device. Available with a battery or mains powered transmitter/s, the Ecomind Electricity Monitor is easy to use and can start saving you money instantly – up to 10% on your electricity bill. Single Phase Kit - includes just 1 sensor for houses on a single phase supply. 3 Phase Kit - includes 3 sensors for houses on a three phase supply. Houses with 4 discrete or stranded cables are Three Phase and need the 3 phase kit. Another way to check is count the main fuses in the electricity supply switchboard. Three large 'inbound supply' fuses or three electricity meters usually means 3 phase supply. If you are not sure what you have, please email a photo to Nous House sales or ask your electrician. Though this unit is simple to install just requiring sensors to be clamped around the phase cable/s, IN AUSTRALIA BY LAW ALL electrical installations involving high voltage electricity (240VAC) MUST be performed by a qualified electrical contractor. Further Information on the Clipsal Ecomind, how to be more energy efficient and other products that can reduce your power bill and enhance your lifestyle is below.